There’s a black hole in a galaxy 22 million light-years away that’s incredibly bright and energetic. Astronomers naturally assumed it was a supermassive black hole. But new observations show it’s actually quite tiny — throwing many conceptions of what we thought we knew about these things completely out the window. Black holes come in two types, possibly three. Or four. We’ve got our supermassive black hole variety, the kind you might find at a galaxy’s core. As its name would suggest, these things are absolutely huge, weighing in at about a billion times the mass of our Sun. 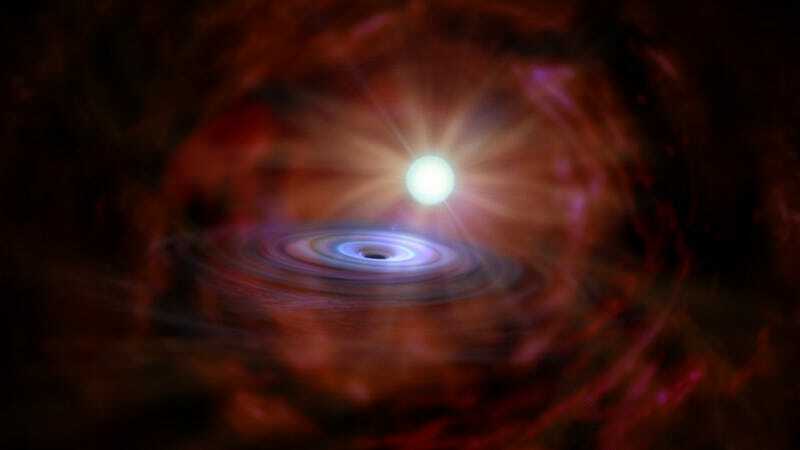 At the other side of the spectrum are stellar mass black holes, objects with a mass comparable to that of our Sun. Then there’s mid-sized black holes, or intermediate mass black holes (IMBH), at about 10 to 100 times the mass of our Sun. Astronomers also think there are “middleweight” black holes out there, weighing in anywhere from 20,000 to 90,000 times the sun’s mass — but more observations are need to confirm these findings. Small black holes are known for their high-energy X-rays, while larger black holes give off low-energy X-rays. Also known as hard and soft X-rays, these emissions are caused not by the black hole itself, but by the rapidly accelerating mass of matter swirling around it. So, the lower the X-ray energy, the bigger the black hole. Finally! A black hole that you can visit and survive! Which leads us to the strange black hole in question, M101 ULX-1. This thing is giving off low-energy X-rays and insanely bright illumination — flares that are 100 times brighter than usual, thus designating the system an ultraluminous X-ray source (known as ULX). Ordinary stellar black holes can’t emit flashes that bright — at least not unless it’s consuming mass at an unexpectedly higher rate. Astronomers figured M101 ULX-1 was an IMBH, but new observations made at the Gemini Observatory tell another story, namely that it’s actually a tiny black hole — about 20 to 30 times the mass of the Sun (and possibly as small as 5 times). The scientists determined this after confirming that the system consists of the black hole and a companion star, a so-called Wolf-Rayet system. What’s more, because they were able to see how often the black hole and the star orbit around each other — once every 8.2 days — they were able to calculate the black hole’s mass. So the book on stellar black holes needs to be rewritten. One theory is that the Wolf-Rayet’s strong stellar winds are fuelling the black hole enough to cause these exaggerated emissions. And indeed, the study showed that the black hole in M101 ULX-1 can capture more material from stellar winds than astronomers had anticipated. And crazily enough, the observation also suggests that IMBHs might not even exist! Should that be the case, we’d be back down to just two classes of black holes. "Astronomers hoping to study these objects will now have to focus on other locations for which indirect evidence of this class of black holes has been suggested, either in the even brighter 'hyper-luminous' X-ray sources or inside some dense clusters of stars," explained research team member Joel Bregman in a statement. Read the entire study at Nature: “Puzzling accretion onto a black hole in the ultraluminous X-ray source M 101 ULX-1”.